Mushrooms are much more than a tasty pizza topping; they are a major health food. In fact, certain mushroom species have significant healing properties that have been used widely across cultures and continents. Sometimes called “functional mushrooms,” these species have very unique benefits, which may target cancer, liver disease, and Alzheimer’s, among others. The fungi are now experiencing a surge in Western medicine as scientists begin to take note of their multipurpose nutrients. What Makes These Mushrooms Unique? Functional mushrooms, for our purposes, are species that appear to possess unique health benefits and have medicinal uses in the body. Some of these mushrooms have been used regionally for up to 5,000 years and continue to be central to certain medicinal practices. Only recently, however, has a growing body of research been devoted to supporting these anecdotal benefits with scientific proof. New work is exploring whether these mushrooms can enhance health even further through both prevention and treatment—mixing the old with the new, so to speak. Ancient medicinal practices like Traditional Chinese Medicine (TCM) are rooted in prevention and are therefore proactive, whereas Western medicine is rooted in treatment, thereby making it reactive. Preliminary results are pointing to preventive qualities for the immune system, as well as against cancer. The potential benefits of functional mushrooms comprise an ever-growing list that gets increasingly impressive as more studies are done. Although the research is largely still in its infancy, lab, animal, and human tests have all showed promise thus far. As these species are further researched and more knowledge about their capabilities is acquired, the list of benefits will likely clarify. That’s quite a list, and the benefits derive from the four mushrooms we’ll be looking at today: cordyceps, reishi, lion’s mane, and chaga. Although each one of the species listed above is unique and useful in its own way, functional mushrooms do share some special qualities. Polysaccharides, for example, play an important role in overall health and are found in high amounts in cordyceps, reishi, lion’s mane, and chaga. These are complex carbohydrates (some non-digestible fibers) that help provide energy while also helping maintain cell structure. They are also thought to stimulate the immune system by promoting healthy gut bacteria. Their role in immunity and inflammation also inhibits the effects of invaders. Therefore, they could potentially help battle or prevent infection, and support healthy blood sugar, cholesterol and blood pressure levels, supple skin, and more. Polysaccharides are likely the mechanism behind these medicinal mushrooms’ many health benefits. However, variations between them allow each variety to offer a little something different, as active compounds differentiate. Cordyceps have been used for 2,000 to 5,000 years in Indian Ayurvedic medicine, Tibetan medicine, and TCM. They grow in high elevations—5,800 feet and up—in the Sikkim Mountains, part of the Himalayas, and are a unique caterpillar and fungus combination. The Cordyceps sinensis is formed when a fungus grows around the larvae of a caterpillar. It then germinates, kills, and mummifies the little caterpillar, and out of the mummy grows a brown stalk where the beneficial compounds are found. The stalk looks similar to an apple stalk but grows to about the length of a match. Therapeutic benefits of cordyceps were originally discovered when farmers noticed their effects on animals. After feeding, they noted more energized behavior, greater endurance, and less fatigue. Since then, they have been used on humans to prevent and treat a number of conditions. Anti-aging: Cordyceps may help protect telomeres—the protective ends of chromosomes that reside in the nucleus of each cell. The length of telomeres is closely associated with Alzheimer’s, atherosclerosis, high blood pressure, type 2 diabetes, and cancer risk. Prevention and treatment of infections like coughs, colds, and bronchitis. Cordyceps use is safe for most populations except for pregnant or breastfeeding women, people with existing autoimmune diseases, or those on specific medications. Known as lingzhi in Chinese and also called the “king of mushrooms,” the reishi mushroom and its benefits have been central to TCM for around 2,000 years. Native to China, Japan, and Korea, reishi was and is still used to battle the negative impacts of stress. 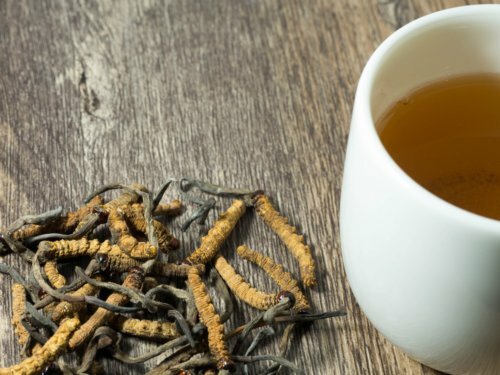 It’s classified as an adaptogen like cordyceps, meaning it helps the body absorb stressors. The active compounds that make reishi a unique remedy are polysaccharides and triterpenes. Polysaccharides, as mentioned, have strong antioxidant abilities, while triterpenes—groups of compounds including phytosterols and phytoecdysteroids found in plant resins and gums—may stop tumor growth and prevent cancer from metastasizing, as well as provide a host of other benefits. Liver protection, possibly preventing liver disease (also central to its use as preventive medicine in TCM). Reishi is generally safe for most of the population, but as with cordyceps, those pregnant and nursing, with existing immunity problems, or on medications should avoid usage. Lion’s mane is a furry-looking mushroom that, as its name suggests, resembles the mane of a lion. Native to North America, Europe, and Asia, the Hericium erinaceus is a mushroom species that could have some noteworthy benefits for brain function. Classified as a nootropic, a popular “brain booster” category in TCM, lion’s mane may not only repair and protect brain tissue, but it may also battle cancer. The effectiveness of lion’s mane, as with other functional mushrooms, is a growing area of research and is continually being tested so that it’s better understood. But so far, a number of promising studies have shown its benefits for brain health. Lion’s mane benefits for brain health are likely connected to its ability to enhance neural outgrowth. Neural outgrowth essentially means the growth of axons and dendrites. Axons are responsible for taking information away from the cell body, and dendrites bring information to the cell body. They are imperative for exchanging neural impulses with the brain, and are therefore necessary for optimal brain function. By promoting their growth, lion’s mane could potentially slow or reverse cell degeneration in the brain, a common characteristic in Alzheimer’s and Parkinson’s diseases. Studies have also shown lion’s mane benefits for mild cognitive impairment. Lion’s mane is generally safe for consumption and is typically consumed as part of a mushroom tea or coffee. Known as black gold, chaga—or Inonotus obliquus—is a type of cold-climate fungus that grows on birch trees. Lumpy looking and black, almost like burnt charcoal, it’s been used in Russian and Northern European healing practices for centuries. Chaga can also be found in Northern Canada, Siberia, and Alaska. In 2005, chaga earned the highest score on the ORAC scale (now, it’s No. 15), which measures the antioxidant capabilities of food. There is some controversy around the legitimacy of the ORAC score, which stands for Oxygen Radical Absorbent Capacity, because it’s tested in the lab and not in humans. Still, other foods with high ORAC scores such as blueberries have been found highly beneficial to human health. Because of this score and chaga’s antioxidant capabilities, the mushroom has been highlighted for potential benefits to cancer, heart disease, liver disease, and diabetes. But chaga benefits may not end there. Chaga needs to be broken down with hot water or alcohol to release its beneficial compounds, and is usually taken as an extract or consumed as part of a tea or coffee. It can also be purchased as a capsule. A common way to consume mushroom supplements and get their benefits is through teas or coffee. Cordyceps, chaga, lion’s mane, and reishi are often infused in hot or boiling water to achieve a desired outcome. Some companies sell blends or individual mushroom coffees and elixirs. If you want to make your own, you’d have to purchase your own mushrooms or forage for them—and both can be a little difficult—then make the proper adjustments. Remove and add some maple syrup or honey for a sweetener. You can follow similar directions for other mushrooms or make your own blends. But it might be easier to buy them premade. You can also purchase powder or capsule extracts. Mushrooms have been used for thousands of years, and the fact that they’re still in use and being more thoroughly explored by science makes them a food worth considering for your diet. This is especially true because recent scientific studies, although relatively limited, show promising results. The antioxidant capabilities, as well as some of the immediate results you may experience—increased focus, less stress, better sleep, and more energy—make these supplements an interesting area of study with potentially revolutionary benefits. Swain, K., et al, “Traditional uses and medicinal potential of Cordyceps sinensis of Sikkim,” Journal of Ayurvedic and Integrative Medicine, Jan. to Mar. 2011; 2(1): 9–13; DOI: 10.4103/0975-9476.78183; https://www.ncbi.nlm.nih.gov/pmc/articles/PMC3121254/, last accessed February 20, 2018. Patel, K., “Cordyceps,” Examine, 2018; https://examine.com/supplements/cordyceps/, last accessed February 20, 2018. Li, S., et al, “Anti-oxidation activity of different types of natural Cordyceps sinensis and cultured Cordyceps mycelia,” Phytomedicine, May 2001; 8(3):207-12; https://www.ncbi.nlm.nih.gov/pubmed/11417914, last accessed February 20, 2018. Lin, B., et al, “Herbal Medicine: Biomolecular and Clinical Aspects. 2nd edition, Chapter 5: Cordyceps as an Herbal Drug,” 2011; https://www.ncbi.nlm.nih.gov/books/NBK92758/, last accessed February 20, 2018. Chen, S., “Effect of Cs-4 (Cordyceps sinensis) on exercise performance in healthy older subjects: a double-blind, placebo-controlled trial,” Journal of Alternative and Complementary Medicine, May 2010; 16(5): 585–590; DOI: 10.1089/acm.2009.0226; https://www.ncbi.nlm.nih.gov/pubmed/20804368, last accessed February 20, 2018. Liu, X., et al, “Cordyceps sinensis protects against liver and heart injuries in a rat model of chronic kidney disease: a metabolomic analysis,” Acta Pharmacologica Sinica, May 2014; 35(5):697-70; DOI: 10.1038/aps.2013.186; https://www.ncbi.nlm.nih.gov/pubmed/24632844, last accessed February 20, 2018. Ghiringhelli, F., et al, “CD4+CD25+ regulatory T cells suppress tumor immunity but are sensitive to cyclophosphamide which allows immunotherapy of established tumors to be curative,” European Journal of Immunology, Feb. 2004; 34(2):336-44; DOI: 10.1002/eji.200324181; http://onlinelibrary.wiley.com/doi/10.1002/eji.200324181/full, last accessed February 20, 2018. “Cordyceps,” WebMD, 2018; https://www.webmd.com/vitamins-supplements/ingredientmono-602-cordyceps.aspx?activeingredientid=602&activeingredientname=cordyceps, last accessed February 20, 2018. “How Mushrooms Effect Longevity,” Terrafunga, 2018; https://www.terrafunga.com/how-mushrooms-effect-longevity/, last accessed February 20, 2018. Mohan, C., “Reishi Mushroom,” WebMD, May 22, 2017; https://www.webmd.com/vitamins-and-supplements/reishi-mushroom-uses-and-risks#1, last accessed March 12, 2018. Silva, D., “Ganoderma Lucidum (Reishi) in Cancer Treatment,” Integrative Cancer Therapies, Dec. 2003; 2(4):358-64; DOI: https://doi.org/10.1177/1534735403259066; http://journals.sagepub.com/doi/10.1177/1534735403259066, last accessed March 12, 2018. Suarez-Arroyo, I., et al, “Anti-tumor effects of Ganoderma lucidum (reishi) in inflammatory breast cancer in in vivo and in vitro models,” PLoS One, February 28, 2013; 8(2):e57431; DOI: 10.1371/journal.pone.0057431; https://www.ncbi.nlm.nih.gov/pubmed/23468988, last accessed March 12, 2018. Jin, M., et al.,“Biological activities and potential health benefit effects of polysaccharides isolated from Lycium barbarum L.” International Journal of Biological Macromolecules, November 28 2012, DOI: 10.1016/j.ijbiomac.2012.11.023; https://www.ncbi.nlm.nih.gov/pubmed/23200976, last accessed March 12, 2018. Wu, X., et al., “Hepatoprotective effects of aqueous extract from Lingzhi or Reishi medicinal mushroom Ganoderma lucidum (higher basidiomycetes) on α-amanitin-induced liver injury in mice,” International Journal of Medical Mushrooms, 2013; 15(4):383-91; https://www.ncbi.nlm.nih.gov/pubmed/23796220, last accessed March 12, 2018. Batra, P., “Probing Lingzhi or Reishi medicinal mushroom Ganoderma lucidum (higher Basidiomycetes): a bitter mushroom with amazing health benefits,” International Journal of Medicinal Mushrooms, 2013; 15(2):127-43; https://www.ncbi.nlm.nih.gov/pubmed/23557365, last accessed March 14, 2018. Klupp, N., et al, “Ganoderma lucidum mushroom(lingzhi/reishi) for treating cardiovascular risk factors,” Cochrane Database of Systematic Reviews, 2015 Issue 2, DOI: 10.1002/14651858.CD007259; https://www.ncbi.nlm.nih.gov/pubmedhealth/PMH0072281/, last accessed March 14, 2018. Friedman, M., “Chemistry, Nutrition, and Health-Promoting Properties of Hericium erinaceus (Lion’s Mane) Mushroom Fruiting Bodies and Mycelia and Their Bioactive Compounds,” Journal of Agricultural and Food Chemistry, Aug. 2015; 63(32):7108-23; DOI: 10.1021/acs.jafc.5b02914; https://www.ncbi.nlm.nih.gov/pubmed/26244378, last accessed March 14, 2018. Samberkar, S. et al, “Lion’s Mane, Hericium erinaceus and Tiger Milk, Lignosus rhinocerotis (Higher Basidiomycetes) Medicinal Mushrooms Stimulate Neurite Outgrowth in Dissociated Cells of Brain, Spinal Cord, and Retina: An In Vitro Study,” International Journal of Medicinal Mushrooms, 2015; 17(11):1047-54; https://www.ncbi.nlm.nih.gov/pubmed/26853959, last accessed March 14, 2018. Lai, P., et al, “Neurotrophic properties of the Lion’s mane medicinal mushroom, Hericium erinaceus (Higher Basidiomycetes) from Malaysia,” International Journal of Medicinal Mushrooms, 2013; 15(6):539-54; DOI 10.1615/IntJMedMushr.v15.i6.30 ; https://www.ncbi.nlm.nih.gov/pubmed/24266378, last accessed March 14, 2018. Kim, M., et al., “Enhancement of the neuroprotective activity of Hericium erinaceus mycelium co-cultivated with Allium sativum extract,” Archives of Physiology and Biochemistry, Feb. 2015; 121(1):19-25; https://www.tandfonline.com/doi/abs/10.3109/13813455.2014.974618?journalCode=iarp20, last accessed March 14, 2018. Park, Y., et al, Effect of an exo-polysaccharide from the culture broth of Hericium erinaceus on enhancement of growth and differentiation of rat adrenal nerve cells,” Cytotechnology, Sept. 2002; 39(3): 155–162; DOI: 10.1023/A:1023963509393, https://www.ncbi.nlm.nih.gov/pmc/articles/PMC3449638/, last accessed March 14, 2018. Tsai-Teng, T., et al, “Erinacine A-enriched Hericium erinaceus mycelium ameliorates Alzheimer’s disease-related pathologies in APPswe/PS1dE9 transgenic mice,” Journal of Biomedical Science, June 2016; 23(1):49; DOI: 10.1186/s12929-016-0266-z; https://www.ncbi.nlm.nih.gov/pubmed/27350344, last accessed March 14, 2018. Mori, K., et al, “Improving effects of the mushroom Yamabushitake (Hericium erinaceus) on mild cognitive impairment: a double-blind placebo-controlled clinical trial,” Phytotherapy Research, March 2009; 23(3):367-72; DOI: 10.1002/ptr.2634; https://www.ncbi.nlm.nih.gov/pubmed/18844328, last accessed March 14, 2018. Kuo, H., et al., “Hericium erinaceus mycelium and its isolated erinacine A protection from MPTP-induced neurotoxicity through the ER stress, triggering an apoptosis cascade,” Journal of Translational Medicine, March 2016, DOI: 10.1186/s12967-016-0831-y; https://www.ncbi.nlm.nih.gov/pubmed/26988860, last accessed March 14, 2018. Lee, S., et al, “A new cerebroside from the fruiting bodies of Hericium erinaceus and its applicability to cancer treatment,” Bioorganic & Medicinal Chemistry Letters, Dec. 2015, DOI: 10.1016/j.bmcl.2015.10.092; https://www.ncbi.nlm.nih.gov/pubmed/26547693, last accessed March 14, 2018. Li, W., “Isolation and identification of aromatic compounds in Lion’s Mane Mushroom and their anticancer activities,” Food Chemistry, March 2015, DOI: 10.1016/j.foodchem.2014.08.078; https://www.ncbi.nlm.nih.gov/pubmed/25306354, last accessed March 14, 2018. Kim, S., et al., “Mechanism of Hericium erinaceus (Yamabushitake) mushroom-induced apoptosis of U937 human monocytic leukemia cells,” Food & Function, June 2011, DOI: 10.1039/c1fo10030k; https://www.ncbi.nlm.nih.gov/pubmed/21779573, last accessed March 14, 2018. Kim, S., “Hericium erinaceus (Lion’s Mane) mushroom extracts inhibit metastasis of cancer cells to the lung in CT-26 colon cancer-tansplanted mice,” Journal of Agricultural and Food Chemistry, May 2013, DOI: 10.1021/jf400916c; https://www.ncbi.nlm.nih.gov/pubmed/23668749, last accessed March 14, 2018. Yang, B, et al, “Hypolipidemic effect of an Exo-biopolymer produced from a submerged mycelial culture of Hericium erinaceus,” Bioscience, Biotechnology Biochemistry, June 2003; https://www.ncbi.nlm.nih.gov/pubmed/12843656, last accessed March 14, 2018. Mori, K. et al, “The Anti-Inflammatory Effects of Lion’s Mane Culinary-Medicinal Mushroom, Hericium erinaceus (Higher Basidiomycetes) in a Coculture System of 3T3-L1 Adipocytes and RAW264 Macrophages,” International Journal of Medicinal Mushrooms, 2015, DOI: 10.1615/IntJMedMushrooms.v17.i7.10; http://www.dl.begellhouse.com/journals/708ae68d64b17c52,05ab5a7e40e7ba9a,23e858671d0eab97.html, last accessed March 14, 2018. Furuta, S., et al, “Hericium erinaceus extracts alter behavioral rhythm in mice,” Biomedical Research, 2016, DOI: 10.2220/biomedres.37.227; https://www.ncbi.nlm.nih.gov/pubmed/27544998, last accessed March 14, 2018. Nagano, M., et al, “Reduction of depression and anxiety by 4 weeks Hericium erinaceus intake,” Biomedical Research, 2010, DOI: https://doi.org/10.2220/biomedres.31.231; https://www.jstage.jst.go.jp/article/biomedres/31/4/31_4_231/_article, last accessed March 14, 2018. Liang, B., et al, “Antihyperglycemic and antihyperlipidemic activities of aqueous extract of Hericium erinaceus in experimental diabetic rats,” BMC Complementary Medicine, Oct. 2013, DOI: 10.1186/1472-6882-13-253; https://www.ncbi.nlm.nih.gov/pmc/articles/PMC3852124/, last accessed March 14, 2018. “Chaga has the highest ORAC score ever recorded in any natural food! 6.5 times more than Acai berry,” PRLOG, September 5, 2010; https://www.prlog.org/10909725-chaga-has-the-highest-orac-score-ever-recorded-in-any-natural-food-65-times-more-than-acai-berry.html, last accessed March 14, 2018. Arata, S., “Continuous intake of the Chaga mushroom (Inonotus obliquus) aqueous extract suppresses cancer progression and maintains body temperature in mice,” Heliyon, May 2016, DOI: 10.1016/j.heliyon.2016.e00111; https://www.ncbi.nlm.nih.gov/pmc/articles/PMC4946216/, last accessed March 14, 2018. Youn, M., et al, “Chaga mushroom (Inonotus obliquus) induces G0/G1 arrest and apoptosis in human hepatoma HepG2 cells,” World Journal of Gastroenterology, Jan. 2008, DOI: 10.3748/wjg.14.511; https://www.ncbi.nlm.nih.gov/pmc/articles/PMC2681140/, last accessed March 14, 2018. Kim, Y., “Immunomodulatory Activity of the Water Extract from Medicinal Mushroom Inonotus obliquus,” Mycobiology, Sept. 2005; 33(3):158-62; DOI: 10.4489/MYCO.2005.33.3.158; https://www.ncbi.nlm.nih.gov/pmc/articles/PMC3774877/, last accessed March 14, 2018. Shibnev, V. et al, “Antiviral activity of Inonotus obliquus fungus extract towards infection caused by hepatitis C virus in cell cultures,” Bulletin of Experimental Biology and Medicine, Sept. 2011; https://www.ncbi.nlm.nih.gov/pubmed/22462058, last accessed March 14, 2018. Group, E., “Chaga Mushroom: The Immune-Boosting Superfood,” Global Healing Center, April 17, 2015; https://www.globalhealingcenter.com/natural-health/chaga-mushroom-the-immune-boosting-superfood/, last accessed March 14, 2018.